BENBROOK, Texas – March 1, 2017 – A brand new Marksmen Firearms & Outfitters retail store will open for business on Saturday, March 4 in Benbrook, Texas. This is the third location for Marksmen. There are two other stores in Mansfield and Killeen, Texas. No doubt sportsmen and gun enthusiasts from across the entire Dallas/Fort Worth area will be lined up on Saturday morning ready to enjoy special opening day savings and hourly firearm giveaways. The Ranch, 95.9 FM, will be doing a live remote broadcast from the new store. There will also be live fishing for the kids. “We could not be more excited to part of such a welcoming community. Our goal is to guide and educate our customers to help them find products which best suit their needs. We have some of the most experienced and knowledgeable staff in the industry and we look forward to serving the people of Benbrook and the surrounding area,” said Joey Dello Russo, Director of Operations. 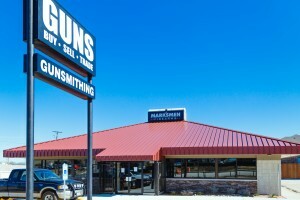 The newest Marksmen Firearms & Outfitters is located 9001 Benbrook Boulevard in Benbrook, Texas. In addition to a large selection of firearms, accessories and ammunition, the store will also provide quality gunsmithing services and handgun training classes. “The Benbrook Area Chamber of Commerce welcomes Marksmen Firearms to our community and organization. We look forward to their active partnership as they’ve displayed in other communities”, said Chamber President, Jamie Presley Barter. Marksmen’s grand opening will be from 10 a.m.-7 p.m. on Saturday, March 4. Normal store hours will be Monday-Saturday, 10 a.m.- 7 p.m. For more information, visit www.marksmenfirearms.com/benbrook or follow them on Facebook at Marksmen Benbrook. Marksmen Firearms & Outfitters is a corporate property of AngMar Retail Group. AngMar Retail Group will open a fourth Marksmen location in Granbury on Saturday, April 1, 2017. The retail group also owns and operates Fat Daddy’s Sports & Spirits Café, Southern Oaks Golf Club and The Oaks Event Center, AutoWorx, House of Hotrods and Fireworx.